This is one of the things that I miss most about home. 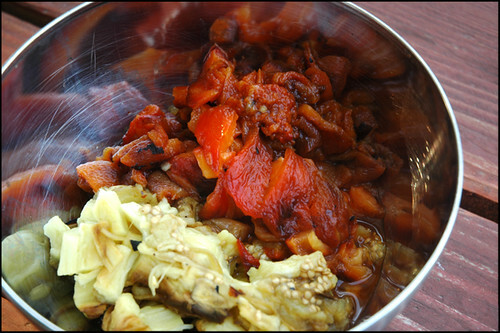 Ajvar. 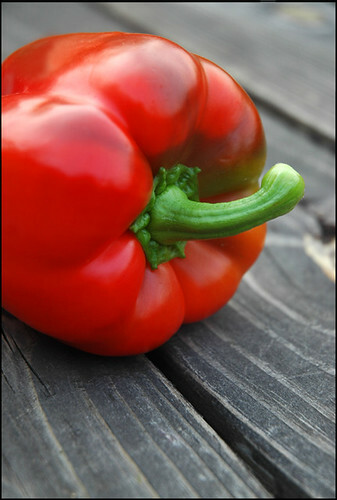 It is basically a relish made of red peppers as a base. From there people usually add eggplant in it, some even onions and tomatoes. 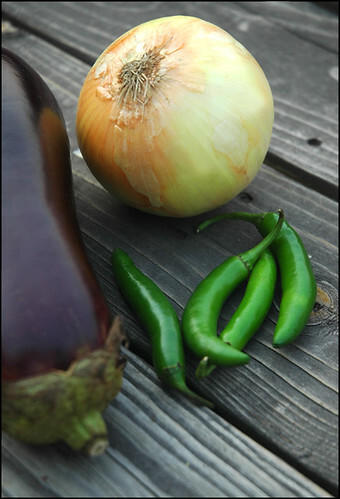 I like to skip the tomato and just do lots of peppers with little of the eggplant and onion. Luckily though, I only make it from a few pounds, and it takes no time at all. Ready for the recipe? I will write the amounts needed for one regular size jar, and from there you can time it by however many jars you would like to make. Wash your peppers eggplant and dry and well. Peel the onion and cut in half. 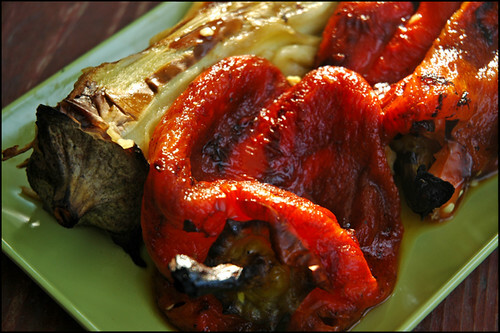 Roast on 450 in the oven or outside on the grill until you have nice black marks on your veggies. You have to blacken them good so it's easier to peel them. When you take them out of the oven or of the grill, put them in a plastic bag and let them stand like that for at least five minutes. (Onions don't have to be blackened or put into the bag). 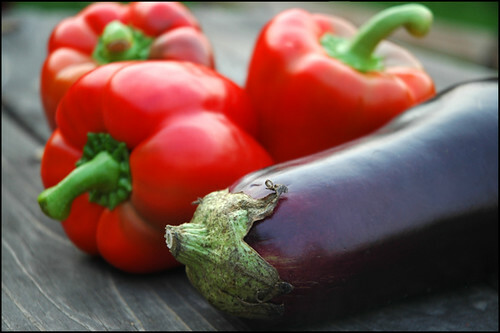 Remove the skin from peppers and eggplant and cut them into one inch pieces. Do the same with the onion. Mince the garlic and the jalapeno. Put all of the vegetables and salt and pepper into a pot on your stove top on medium heat, add the 1/2 cup of oil and 1/4 cup of vinegar and cook for at least two hours steering frequently. Carefully (it's HOT!!!) 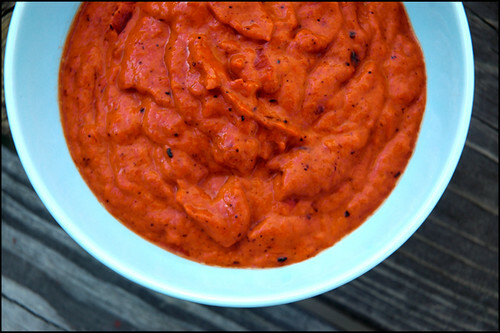 blend your ajvar and return it to the pot for just a few more minutes. 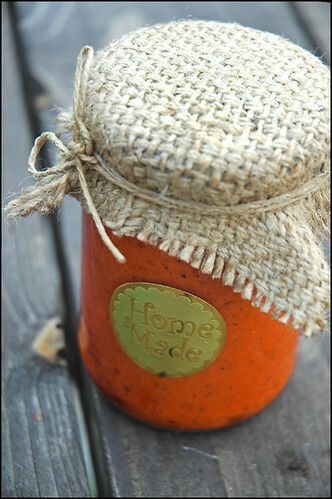 While your ajvar is cooking, you can prepare your jars for canning. Wash them thoroughly and then put into the oven on 170 for about half an hour. Once ajvar is ready to be canned, heat 1 tbsp of oil on the stove top. Pour ajvar into the jar and return to the oven on 350 for a few minutes so it forms a thin crust on the top, then pour oil over it, just enough to cover the top. It should make sizzling sound when it touches ajvar. Put the top on and you are done! You can keep it like this for at least three months. This year I've done my holidays in Croatia. I really like this sauce, it smells of summer! ohooo, najljepsi (i nostalgicni) pozdravi nazad u hrvatsku! 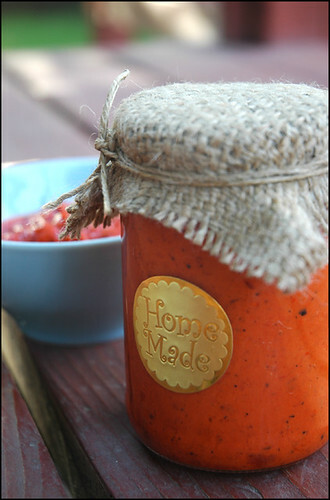 I was searching for the perfect ajvar recipe and so glad I ran into your blog. This looks perfect! Instead of canning them in the oven, can they be put into a hot water bath canner? Can't wait to make this!! Thanks for the recipie I was looking for one today... i found your blog on foodgawker and i could belive i clicked on a croatian one! @Diana, I'm glad you liked it! hi, I found this recipe after searching on Tastespotting and I really, really like it. I'm not Croatian (I'm Norwegian), but a Croatian friend of mine recently introduced me to Ajvar and now I'm addicted. I've made a smaller batch twice already...;) Your recipe is the only one I've seen where you cook the Ajvar after blackening the vegetables, I'm guessing the flavors come out more like this? I used white balsamic vinegar, it gave it a nice sweet twist. Anyway, my Croatian friend told me it was really good and she was impressed that I even gave it a try. So thank you for the great recipe, it's bookmarked and I will always use this one! Hvala! Thank you Gry, I am glad you like it!